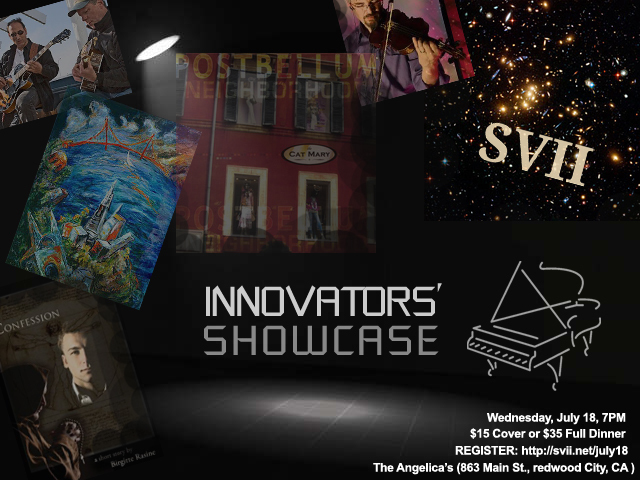 JULY 18th 2012: Innovators’ Showcase! Don’t miss this rare opportunity to be impressed by a full bandwagon or your fellow Silicon Valley innovators! Come enjoy the show and provide your feedback on how SVII can better serve YOU! Showcase Includes: Alternative Jazz, Alternative Country Rock, Secrets of Dark Matter, Language of Art and Science, Live Violin Looping, Live Portait Painting, Insights from Literature.. and more! Adam Kauk: Adam has lived in the Bay Area all his life and has been playing music since he was 9. He works in the software business and enjoys staying involved in SVII and sharing ideas. Andy Markham & The Polyglot Quartet (Shawn Ellis, Chinh Tran, Alan Spearot): Andrew Markham is a Mobile Product Manager at Mindjet, and founder of the band “The Cat Mary”. The Polyglot Quartet draws from funk, jazz, avant garde, and Americana in equal measure. Moving between chill-worthy languid grooves and booty-worthy rumpus, they lay down a simultaneously thoughtful and straight-up greasy sound that would be equally comfortable meeting your mother or meeting your maker. Birgitte Rasine: Author, poet, producer, entrepreneur, Birgitte Rasine serves as the Chief Evolution Officer (CEO) of LUCITÀ Inc., a hybrid design and communications firm. In line with her diverse media career that spans film production, journalism, publishing, communications, marketing and public relations, Birgitte has worked with civil society, business, government and the scientific community. As a journalist, she wrote for Business Week, The Hollywood Reporter and Daily Variety, the entertainment media industry’s two leading publications, and Diálogo Mediterráneo, a tri-lingual journal on policy, economy and the environment in the Mediterranean region. From 1994 to 1996 she wrote screenplays for an independent production company in Los Angeles; in 1997, three of her plays for children were staged in the San Francisco Bay Area. Prior to that, she worked in visual effects, camera and lighting on Hollywood and independent feature films for companies such as PDI/Dreamworks, ILM, Universal Studios, HBO, and Disney, and credits them for giving her time in the trenches. Birgitte holds a BA in Film Aesthetics from Stanford University, studied cinematography at the American Film Institute in Los Angeles, and completed a professional masters degree in international relations in Spanish at the Instituto Universitario Ortega y Gasset in Madrid, Spain. She is a Founding Circle member of the Association of Women in Water, Energy and the Environment, as well as member of other professional organizations, and sits on the board of directors of the American Fund for Czech and Slovak Leadership Studies, a non profit organization in New York City dedicated to supporting the leaders of tomorrow. Elzbieta Holsztynska: Ela is a published author of multiple scientific papers. She holds a PhD in pharmacology from the University of Michigan, Ann Arbor, MI, followed by post-doctoral research at Harvard Medical School, and has had a successful career in the biotech and pharma industry. Even as a little girl, Ela had always been amazed by the number of unanswered questions out there and fascinated by the quest for answers. As she explored the art treasures of Rome, Florence and Venice, and played and listened to countless hours of Bach and Chopin music, Ela was, interestingly, inspired to find new insights in science. To Ela, the trick is to ask questions using language that Mother Nature can understand so as to produce the answers. (Then, it all comes down to understanding the answers!) Visual art and music help to find the clues, and Ela’s current quest is to patent novel targets for the control of Alzheimer’s disease. Geri McGilvray: Geri is a native of San Francisco. She has won over 50 awards and her paintings are in collections throughout the US. Geri is known for working in several art forms: oil, acrylic, watercolor, mixed media, and sculpture. There is a lyrical quality expressed in her work, form imaginative brush strokes to a bold expressive use of colors. Geri loves to express her feelings and ideals. Her work conveys memories and images over the years form abstract expressions to impressionist paintings. Geri studied art and architecture at San Francisco State University. She continued studying art and art history in Europe over the years with professors in France and London. Jason Marsh: Jason has over 17 years of experience as a user interface engineer, information architect, and software designer. Prior to joining Acesis, Jason served as senior architect at Dorado Corporation where he was a key member of the development team that designed and implemented the company’s flagship solution by working closely with customers. Jason is an expert in browser-based design and development, specifically with rich Internet application technologies. Jason has a Bachelors of Music from Berklee College of Music, Boston, in Jazz Violin Performance, and a Masters of Music from San Jose State University in Composition. Neubop (Howard Lieberman, Dave Solhaug): NeuBop was created to satisfy a broad range of situations ranging from ambient to concert. Originally NeuBop came about as a jazz form which was a contraction of New Age and Bebop. New Age music’s rapid growth indicates a strong need in the world for beautiful and accessible music. Bebop on the other hand, diminished in popularity as it became more of a musicians music, increasingly difficult to play and for much of the public to understand. After many years of performing it became clear that accessibility, spontaneity and virtuosity were usually not found on the same bandstand. Thomas Buckholtz: Tom has made crucial contributions to innovations in business, government, and technology and for society and the environment. He strives to foster further success globally and locally. Dr. Buckholtz anticipates people’s making significant, widespread gains in effectiveness by using Direct Outcomes checklists. These straightforward tools impart the essence of win-win innovation successes. People can easily learn, benefit from, and propagate the tools (for example, via the book Create Crucial Insight or the e-book Innovate Incisively). He earned a Ph.D. in physics from the University of California, Berkeley, after receiving a B.S. in mathematics from the California Institute of Technology. Likely not yesterday? Or at the very least… not from your boss? Well, here is your chance to show off your alien baby! …At the SVII 7th Anniversary Celebration happening on Wednesday, July 18th at the Angelica’s Bell Theatre & Bistro in Redwood City – the only place around where YOUR brain child can be brought in front of supportive friends and family in a magnificently soulful performance space, solidly entrenched in the midst of three performance stages AND a fortified beer and wine list! Before you let any doubt enter your mind as to whether this is for you, let me just remind you that innovators rarely constrain themselves to being creative in only one form. In fact, the SVII June event was a terrific example of this: While nominally, the topic was “How is Technology Changing Music?”, we thoroughly indulged ourselves with a couple of impromptu performances, one by Scot Sier (whose upcoming new album is “Heads or Tales”) on an instrument designed by Rick Turner (design guru for everything musical), and the other by Andy Markham, the founder of the band ‘The Cat Mary’, and some pointed questions for Rob Hamilton whose biz-card reads Content Czar for Smule (want to turn your cell phone into the most portable of instruments?) and Eli Turner, Rick’s seventeen year old son who is currently designing an eye-popping electric banjo for Bela Fleck using solid modeling. On top of that, those in attendance and the SVII team also made quite an impression. There were people who were instrumental in guiding Apple towards their dominant role in the music world today, and people who worked on X Prizes, and lots of people (the majority I think) who started companies – self taught, academically trained, and everything in between. (Oh, did I mention the awesome Bolero dance piece by Jessie Chen, our new executive director, and her dance partner Roland van der Veen? Or the prototype of a guitar with a built-in amp that also doubled as a music player, demo’ed by one of our attendees?) In fact, the only thing everyone really had in common is that they are super creative, very intelligent (not the same thing) and also really nice (not competing with each other, but all in it together, and enjoying themselves, hanging out before and after the main program).